four weeks of age, when mom weans them. At three weeks of age they are introduced to softened Kibble, which is soaked and made into a warm gruel. What a sight, the first few feedings have the little pups "wearing" more food than eating it. They learn quickly though. due to the fact that the puppy now does not have the competition of it's brothers and sisters beside him/her at the feeding bowl. Do not worry, the puppy will begin eating normally. at approximately 5:00 a.m., 11:30pm and 5:30 p.m while in our care . Just remember what is not eaten will spoil within hours and will need to be thrown out. Of course our feeding schedule of 3x a day at certain times, is not cast in stone and you will come up with your own schedule. 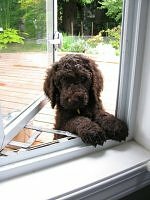 allowing you to get puppy outside immediately after eating (see "Housebreaking") and again well before your bedtime. The morning feeding should be after you've taken the pup outside, let it have it's pee and poo, and a little play session. Until your puppy is 100% toilet trained, just remember "what ever goes in has to come out 20-30 minutes later". Time the middle feeding at a halfway point between the morning and evening feedings or as closely to that as your schedule allows. 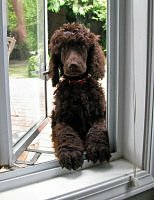 We highly advocate scheduled feedings for Standard Poodle Puppies UNTIL your puppy is toilet trained to go outside. 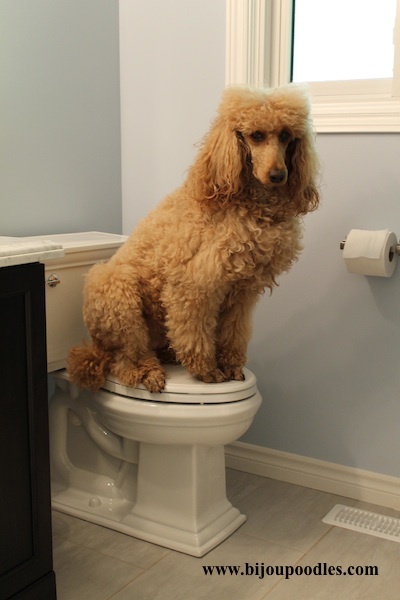 After puppy is toilet trained... PLEASE leave food dish down 24/7 always full. bloating, prevents gorging of food, prevents fussy eaters well the list goes on and on on the benefits. 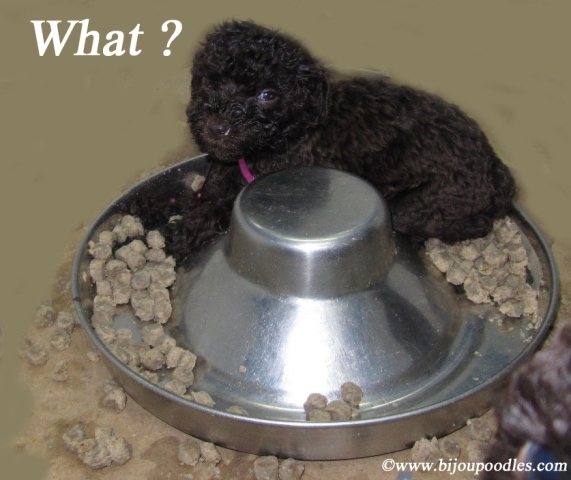 No matter what your Vet says or believes, our Poodles do not and will not over eat ! 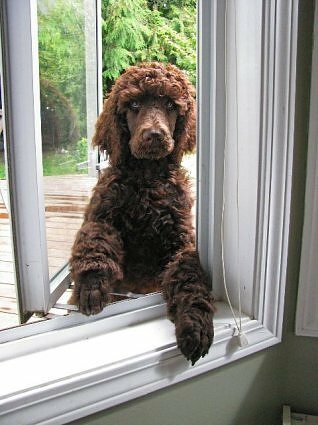 Your Poodle will thrive if allowed to have access to food and water 24/7. Glycerin in dehydrated jerky type treats, dehydrated Chicken Breasts, dog treats, greenies. decreased appetite, decreased activity, vomiting, diarrhea, increased water consumption urination. With blood tests, the dog may have an increased BUN, Blood glucose which is evidence of glycerin's negative affects on the kidneys. In hundreds of dogs kidney failure and death has been reported. and a puppy that will get stomach upset, because they are substituting nutrient enriched foods for the candy like treats. A puppy does not need treats. Praise and play work wonders to motivate. We don't give our pups or dogs treats routinely. 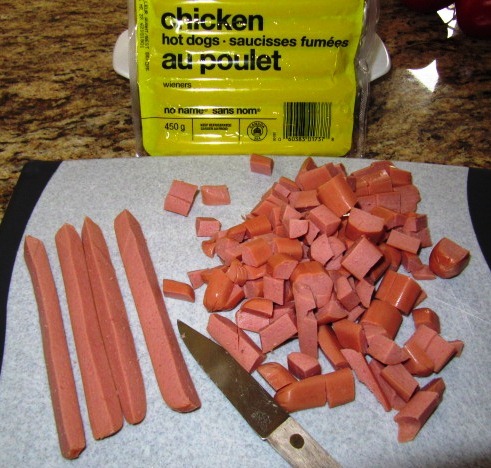 If I wish to bribe my Poodle then I will resort to chicken wieners or sardines. or digestive issues themselves, have this same disorder manifest within their puppies. Do not make food or treat time an anxious time. Do not get them worked up over food or treats. A dog views food as a part of survival. Dogs do not use food to feed emotions the way us humans do. eat grass to settle their tummies and sometimes vomit as a result. wait until it gets cooler in the day or evening, to venture outside for a game of play. Please always remember, that cool, fresh water should be available at all times except during crating times. If you restrict water puppy can develop a Bladder or Urinary Tract Infection. At first offer your puppy about 2 cups of food. 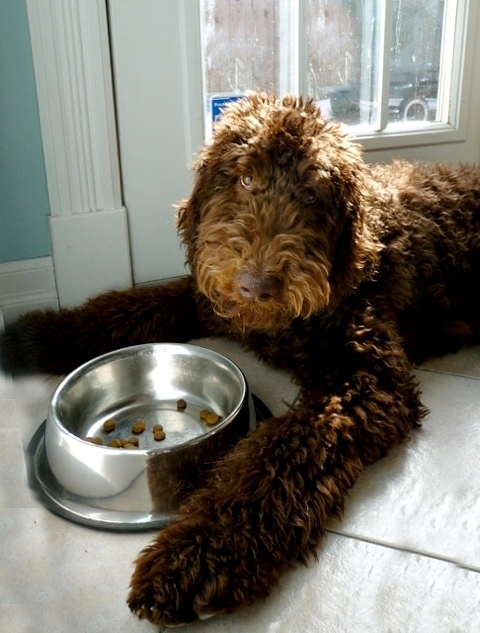 Your puppy should always have kibble left over in their bowl at the end of your feeding time. If there is no food left over, then use common sense ADD MORE next meal !! Let the pup have access to the food for about 20 minutes. What they have not eaten after this time, you take away until next meal time. Continue this through the scheduled feeding times. 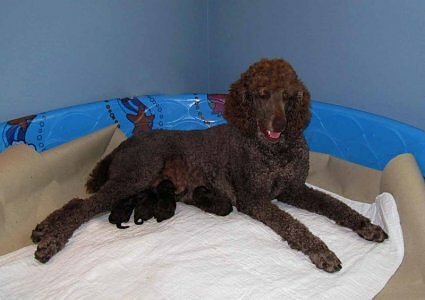 As poodle puppies grow, so too do their appetites. increase the amount of food, just removing the contents after 20 minutes. If there is no kibble left over then you need to give more food. Growing puppies can eat what seems to be a phenomenal amount. and some might even need a very high calorie food because they are burning through calories growing. 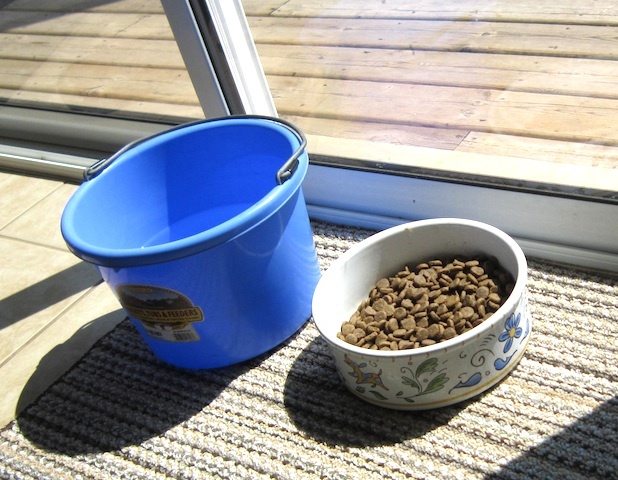 NEVER EVER EVER EVER... restrict your dog's food intake after they are toilet trained. 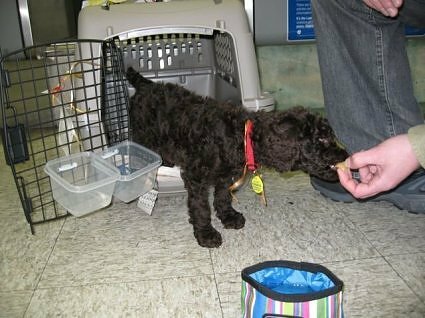 No matter what Vets believe, Poodles are not labs and will not overeat. If your dog does not get enough to eat, their body will start to eat at MUSCLE !! Your poodle should eat enough that it is leaving food behind in the dish. If it is not... add MORE FOOD ! The owner listened to the Vet and fed what they were told to do, ignoring common sense !! This is abuse ! 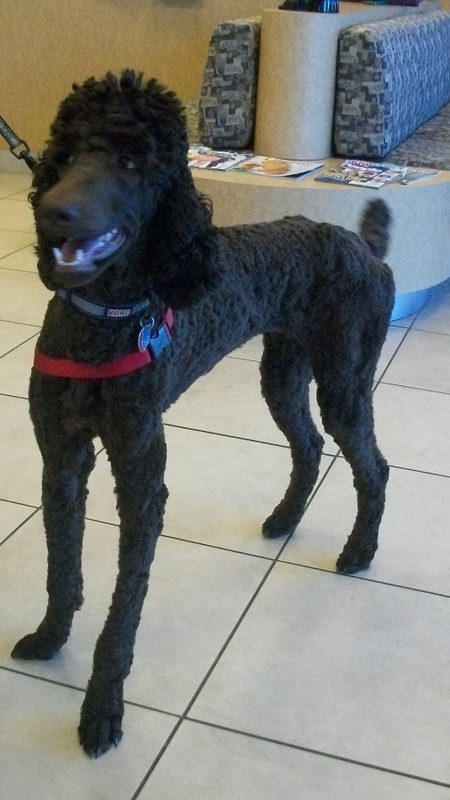 This Poodle's body would be eating muscle in order to survive. Or at least an appropriate amount of food or calorie or quality of food in order to develop properly. DO NOT BLAME THE BREEDER FOR YOUR NEGLIGENCE !! There is no excuse for this. 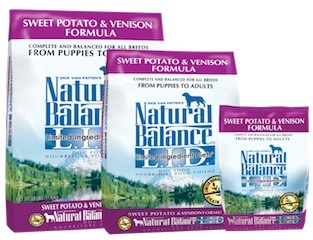 Be responsible and ensure your dog is receiving the proper nutrition to be healthy. At some point between 12-20 weeks your puppy will no longer require three feedings a day. A lot of puppies will let you know when that is. just twice a day instead of three times a day. Once puppy is toilet trained then you may decide to "free feed"
meaning leaving kibble and water in dishes available 24/7. We feel this aids in preventing bloat and making fussy eaters. and more dogs of all breeds, have been having sensitivity to poultry and or diets with grain. having GI upset and bladder issues, so we tend to not believe in coincidences. 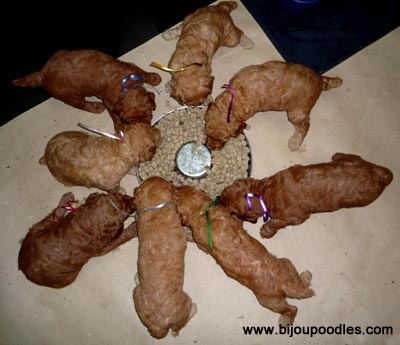 Since starting on this food our pups have not had loose stools and their bladders have been healthier. We can't deny all the amazing reviews of this quality product. Your Puppy's bowl should never be empty. If puppy eats all their food in the alotted time then you should be feeding more. 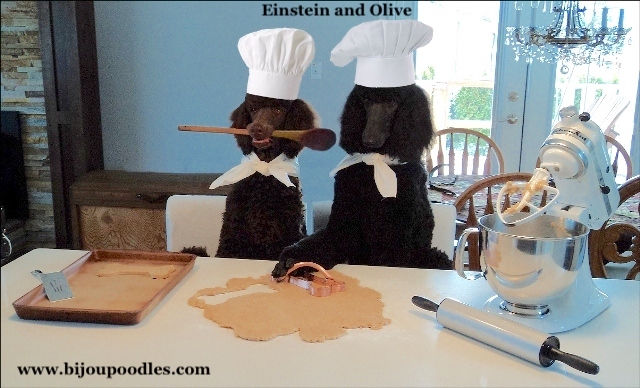 Unlike humans, or other less "refined" dog breeds, Poodles will not over eat. So make sure that puppy has enough food. Do not substitute food with giving treats all day long either. How much should your puppy weigh? This little formula and the Food/Weight chart below should give you a pretty good idea. 1 - 2 lbs. of weight for each week of age. If a puppy is 8 weeks old it should weigh around 8 lbs. This formula is fairly accurate until the dog reaches the age of 3 months. Basically your puppy should have left over kibble in their bowl every meal time during the alloted time limit. If the kibble is all gone in the first few minutes, just add more kibble and know for next time the proper amount. The following amounts are for EACH feeding. Do not worry if there is food left over. to ensure they succeed in getting outside to the proper location. to them 24/7 as this will ensure puppy gets enough food, doesn't learn any gorging behaviours and avoids bloat. This type of feeding is often referred to as "free feeding". to give tiny nibbles of treats. This is not a meal replacement.